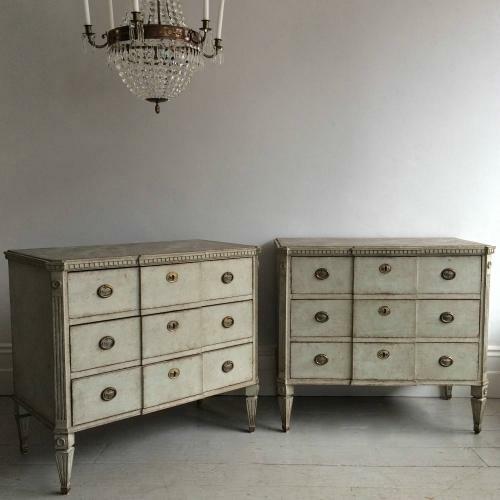 An exceptional pair of richly carved late 19th century Gustavian style chests, perhaps our finest pair of chests to date. These stunning chests feature; beautiful dark grey faux marble painted tops with a decorative dentil trim, over three breakfront drawers, canted & fluted corners with circular motifs, and elegantly tapered & fluted feet with circular motif carvings. The depth of colour and patina on these chests is truly outstanding. At a shade under three feet in width (90cm) these chests are also a little larger than our usual bedside chests and could therefore be used in a reception room or master bedroom. Swedish circa 1890.